Share the post "Top Ten Fibroid Facts"
Did you know that a large percentage of women, like you, bear the burden of dealing with uterine fibroids? Continue reading to find out more facts about fibroids and the embolization procedure. Fibroids stand as a leading problem for a large portion of women. Up to 40 percent of women age 35 and older have uterine fibroids of a significant size. Furthermore, African-American women are at an even greater risk of being affected by fibroids, in which as many as 50 percent of black women have fibroids of a significant size. Fibroid tumors may start in women when they are in their 20’s, however, most women do not begin to have symptoms until they are in their late 30’s or 40’s. In most cases, physicians are not able to predict if a fibroid will grow or cause symptoms. Although the exact cause for fibroid development is still unclear, studies have shown that most of the women affected by fibroids are in their childbearing years. Also, African Americans develop fibroids more often and at a younger age than women of other ethnic groups. 1. Uterine fibroids can affect women of all ages, but are most common in women ages 40 to 50. 3. No one is sure why women develop fibroids which affect 40% of women over 35 years in America and have a high rate of incidence among African Americans. 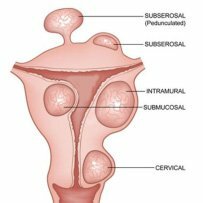 There is a possible link between uterine fibroid tumors and estrogen production. 4. Fibroids are diagnosed with an ultrasound in their gynecologist’s office. Magnetic Resonance Imaging (MRI) is also used to determine how fibroids can be treated and provide information about any underlying disease. 5. Uterine fibroids can be treated with surgery, including hysterectomy, which removes the entire uterus, and myomectomy, which removes the fibroids but leaves the uterus. Both are major surgeries. 6. Approximately 600,000 hysterectomies are performed annually in the United States, about 300,000 due to uterine fibroids. 7. Over 50 percent of women who get hysterectomies have their ovaries removed, rendering them infertile. 8. Embolization has emerged as the safest, simplest, cost effective way to treat fibroids. Embolization requires a very small incision. Embolization basically cures fibroids by starving them. 9. Uterine Fibroid Embolization has an overall success rate of 94 percent. 10. Recurrence after embolization has not occurred. This is one of its major advantages over myomectomy, where fibroids which have been surgically removed often grow back. or give us a call at 866-362-6463. You can also learn more by participating in our live chat Monday through Friday from 9 a.m. to 5 p.m. PST.